There is always risk in buying secondhand appliances. Generally, it's been worth the risk to me. oh my! Little bit is getting so big! 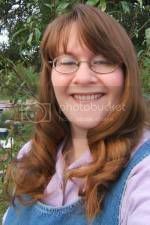 Love the red hair (I have a weakness for the red haired ones ...GRIN!). Sorry to hear about the stove, hopefully you'll be able to get it working. ok can i just say, i love your little girl she is sooooo cute!!!!!!! Congrats on the new stove. Hopefully you'll be able to get the burner situation taken care of soon. 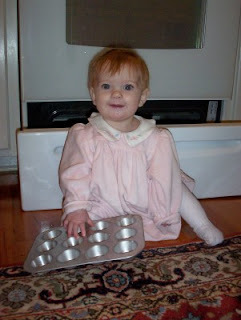 I'm so glad that you have the stove so that you bake muffins for that little one sitting on the floor by it! She is so cute. Maybe some one at your church knows about burners too, ask around, your fix may be just a question away. I know, I have a celebratory loaf of bread baking at the moment! My appliance repairing husband said it is either the connector where the burner plugs in or the switch behind the control knob. I say though that you can get a one burner hot plate for under $20 new. He also said unplug the stove before you do any repairs because it is 220 current and will really hurt you if you get zapped by it. Kat, thanks to your husband for the advice! We will try to repair it, though I rarely cook on all 4 burners at once, anyway. Hi, I had the same problem with our stove. It turned out to be the thermistate (sp?) behind the knob. Not to $$ to fix.